Ludwig Mies van der Rohe is one of the most celebrated modernist architects of the twentieth century, known for developing the International Style in Germany and abroad, which emphasized function, balance, clean lines and the use of glass and steel. 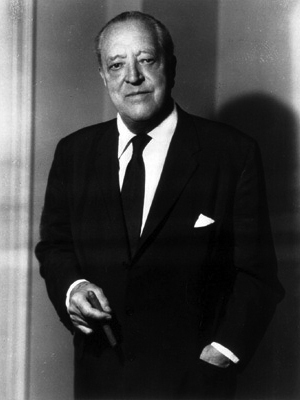 Mies van der Rohe was born in 1886 in Aachen, Germany, a center of heavy industry. His father was a stonecutter and Mies, who was never formally trained in architecture, often worked with his father, developing his exceptional sensitivity to materials at a young age. At 15, he apprenticed with several architectural firms in Aachen, and in 1905 he moved to Berlin to work for architect and furniture designer Bruno Paul. He received his first independent commission in 1907, the Riehl House in Postdam, and it caught the attention of Peter Behrens, the most progressive architect of the era. Mies joined the firm, where he met Le Corbusier and Walter Gropius, who were also working under Behrens. From 1915 to 1918, he served in the war and, upon returning to Berlin, became involved in the very active artistic scene of the 1920s, when Bauhaus De Stijl and Expressionism were all emerging. In 1924, Mies met Lilly Reich, whom he collaborated and was involved with for many years; together, they designed the Barcelona chair, which debuted at the Mies-designed Germany pavilion for the World’s Fair in 1929 and is now regarded as one of the most iconic designs of the modern era. In 1930, Mies became the director of the Bauhaus, working to de-politicize the institution and refocus its efforts on rigorous theory and arts training. After moving the school several times, Mies eventually realized the futility of operating the school under Nazi rule and immigrated to the United States in 1938 to head the architecture program at The Armour Institute of Technology in Chicago (later known as the Illinois Institute of Technology). Upon his arrival, he was enthusiastically introduced to the architectural community by the famously gruff Frank Lloyd Wright, who was a fervent admirer of his work. Mies taught at IIT for twenty years, as well as designed their campus using modernist principles and materials. Throughout the 1940s and 1950s, Mies created some of his most iconic buildings in his “skin and bones” style, exposing the structural elements of the design. The Promontory Apartments (1949) and Lake Shore Drive Apartments (1949-51) in Chicago, as well as the Seagram Building (1956-58) in New York City are considered the pinnacle of the International Style, whose values were adapted worldwide and came to define the look of twentieth century modern industrial society. Mies died in Chicago in 1969, designing right up until his death, leaving behind a monumental body of work and an immense imprint on our contemporary urban landscapes.